FRIENDS are busy organising a creative competition to decorate an Easter Egg, which will be judged during the last week of school before the Easter break. Please see the poster for information. Let your child's imagination run wild and see what wonderful creations they can come up with! Each entry will receive a prize. VOLUNTEER MORNING THURSDAY 18TH OCTOBER AFTER DROP OFF. 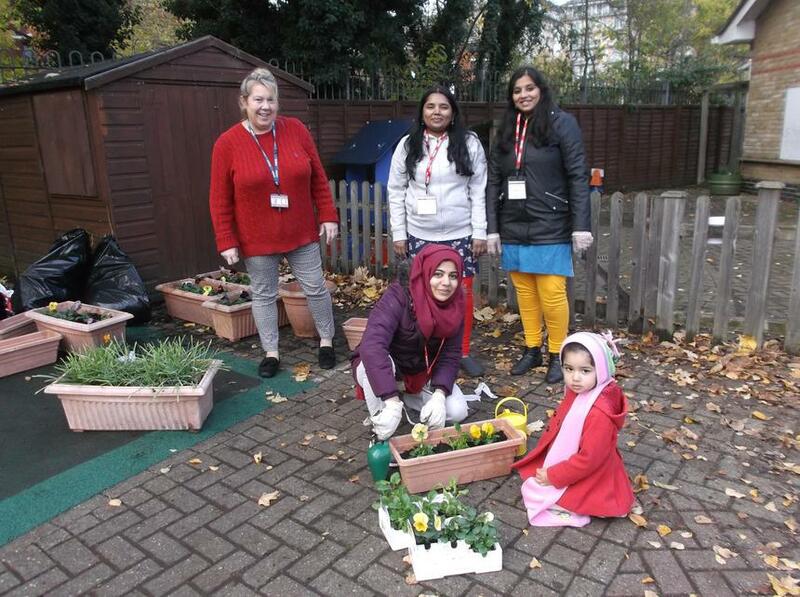 Come and support us to make the school a bright, welcoming environment through the winter months by planting and painting. Please let your class rep know if you can come. Here are the details of our Committee members and our Class Reps for 2018-2019. Look out for their photos up on the boards outside each classroom. They will be keeping their classes up to date with the latest FRIENDS news and events. Welcome to a new school year and an extra special welcome if you are new to the school. Please scroll down to have a look at some of the wonderful events that FRIENDS organised last year. This year we are in the middle of the process of organising two Class Reps for each class. 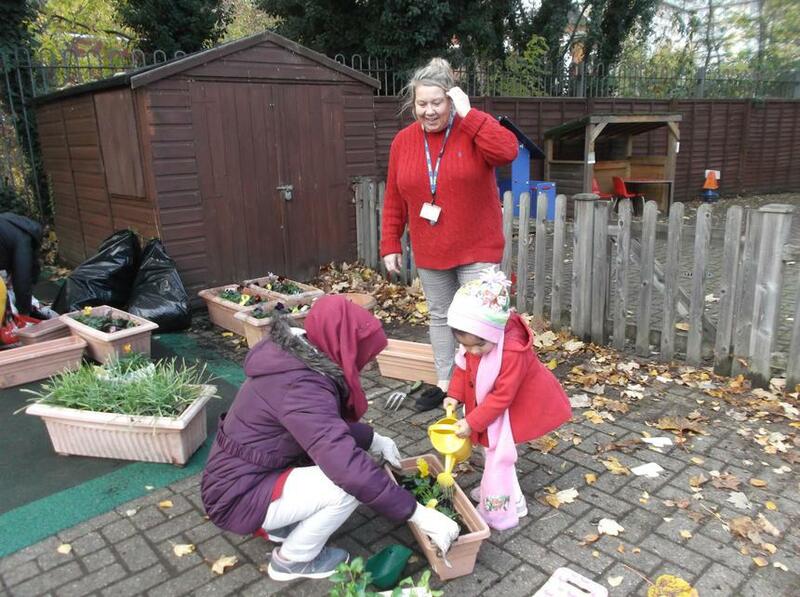 It is not a big job and it is a lovely way to become more involved and get to know people, so please let your class teacher, or Mrs Osei, know if you would like to volunteer. FIRST MEETING: FRIDAY OCTOBER 5TH AFTER DROP OFF. Please come along to find out how you can contribute to FRIENDS and support us to enrich your child's time here at Cardinal Road, biscuits and tea/coffee will be provided! All parents are automatically members of the Friends Association, which organises and runs fund raising and social events for the benefit of the children and their families. Everyone is welcome to attend meetings, and all offers of help are gratefully accepted. We are a diverse group of parents who enjoy working together to contribute to the well being and ethos of the school, so please come along and get involved! Recently money raised by FRIENDS has contributed to visiting theatre productions, school trips and class Christmas presents. We would also like to hear of any new ideas or suggestions for activities and events. Friends usually meet every month in Riverside Room. There are always children's posters around school advertising the next meeting. Please come and offer your ideas; we would really love to see you! Here are the details of the FRIENDS of Cardinal Road Constitution, as well as the current Committee members. Ice lollies were very much in demand and staff, children, parents and carers came together to meet the challenge of Penalty Shoot Out, Hook a Duck. Treasure Hunt and the Tombola to name but a few. The cake stall was a great success, including flapjacks made by the Year 2 children and Gingerbread Men from The Speech and Language Workshop. Children from Year 1 classes made brightly coloured bunting to hang from the stalls and Reception children designed treasure maps and posters. It was lovely to see the whole school community coming together and a big thank you must go to the FRIENDS committee, Rachel our Learning Mentor and the other parents who worked so hard to organise and prepare the stalls and events. In September we will be asking for your support to continue to grow and develop our wonderful FRIENDS group further so watch this space! Setting the stalls up ready for the crowds. Lots of teddies looking for a home. The penalty shootout is ready; come on England! EXCITING NEWS!! EXCITING NEWS!! EXCITING NEWS!! EXCITING NEWS!! FRIENDS of Cardinal Road are organising a Summer Fete on Thursday JUNE 28th 2018. We have lots of fun stalls and activities planned, but we need your help. 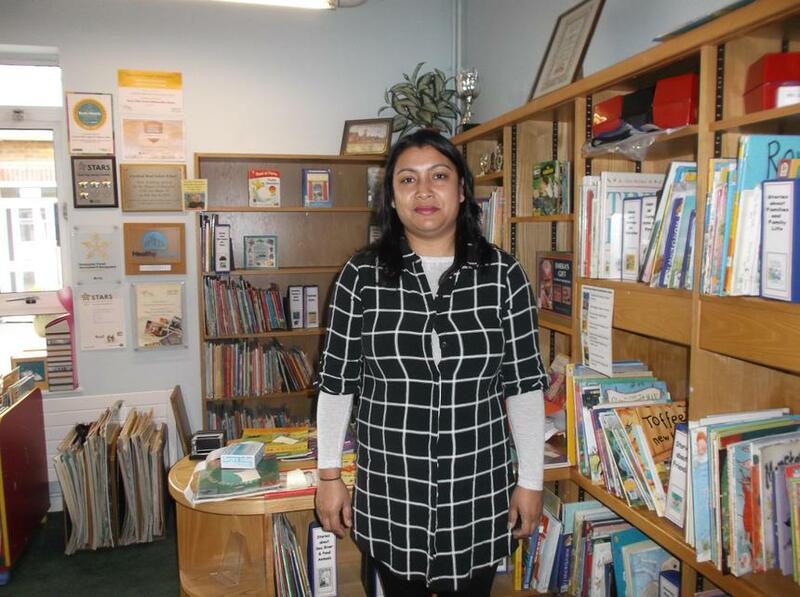 If you are able to support us in any way please contact the Chair of FRIENDS, Basabi Kundu. You can find her around Red Class first thing in the morning, or let Rachel our Learning Mentor know. We will also be asking for different items to be brought into school in the weeks leading up to the Fete, so watch out for a letter with all of the details. On Friday June 22nd we will also be having a mufti day, where children can dress up in the colours of the team that they are supporting for the World Cup, to raise money for the Fete. Please help us to make the day a memorable one for all your children! During the week of December 11th FRIENDS organised a Santa's Grotto for each year group to visit. Donations of decorations were asked for and they worked really hard to transform Riverside Room into a Christmas wonderland! The event was very well attended and both children and parents enjoyed the opportunity to meet Santa at this special time of year. 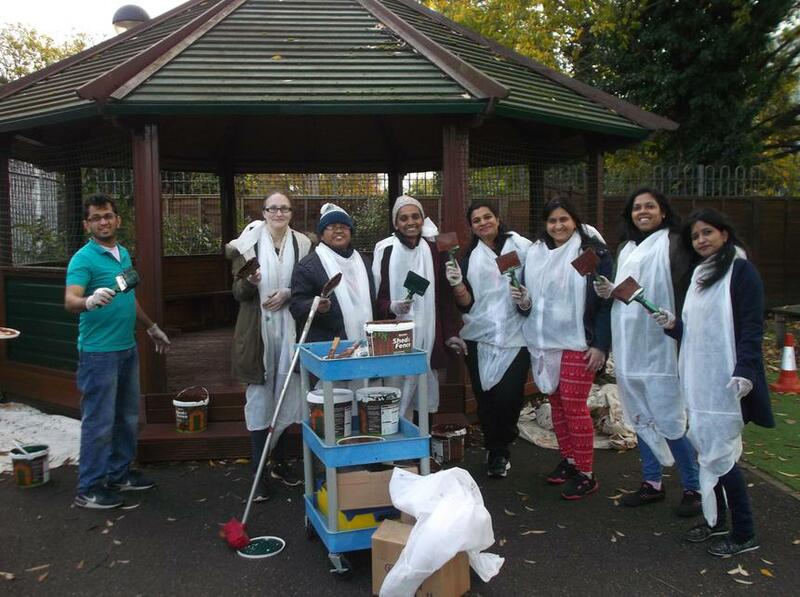 A very big thank you to the volunteers who recently came into school on a crisp November morning to help with painting, gardening and mending books in our school library. 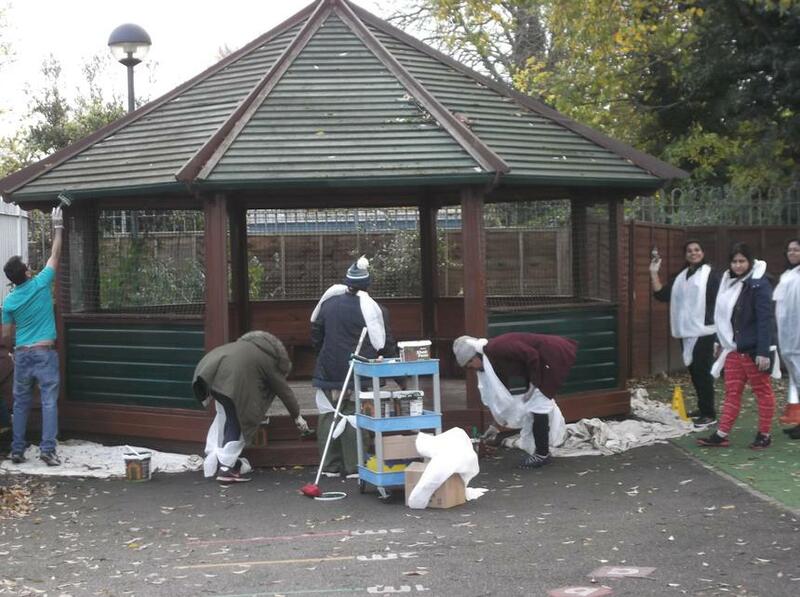 The school environment is now looking colourful and ready for the winter months ahead.